For most folks, it’s not just the “most wonderful time of the year”, it’s also the most stressful. With your days fully-booked with merrymaking, gift-wrapping, working nights, and family engagements, you sometimes wonder when you’ll have time to breathe. Well, holiday stress is common this time of year. 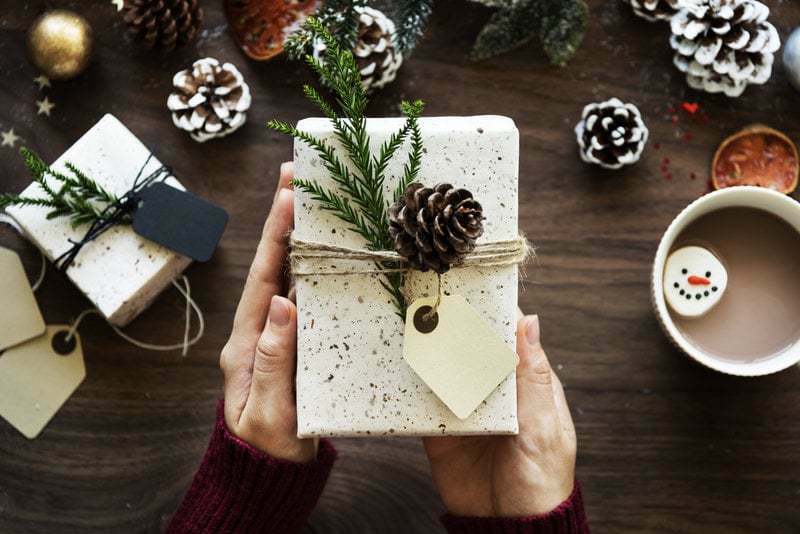 That’s why there are others who choose to spend the Yuletide alone – not because they have no one to celebrate with, but often, due to the stress that comes with the occasion. Cliché as this one sounds, a simple to-do could be a lifesaver. Whether it’s written on paper, or on an app, a to-do list is your little helper when things get stacked on top of the other. Expecting a full day ahead? Just take out your pen (or stylus) and jot down the most important stuff. But don’t go overboard and write 20 things! Keep it simple. 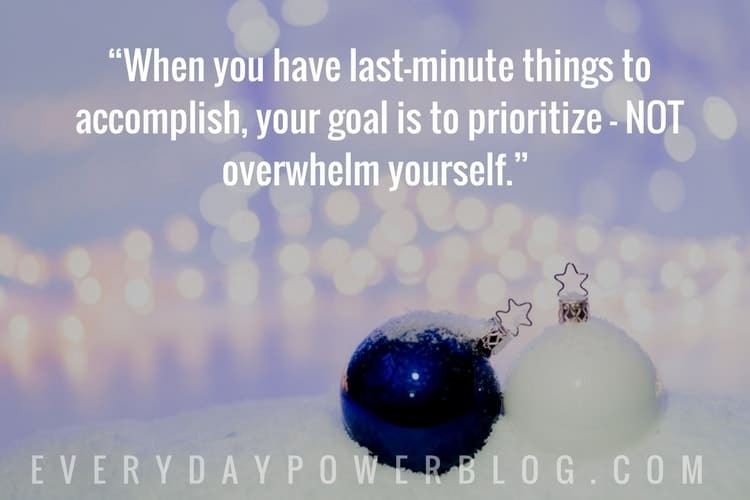 Remember: when you have last-minute things to accomplish, your goal is to prioritize – NOT overwhelm yourself. For example: if you have about 10 things to do for the day before the relatives arrive, take five minutes to sit down and create your list. What are your top five URGENT tasks? It could be a) clean the house, b) prepare snacks, c) get kids ready for the afternoon, d) call husband, and e) drive to the airport. What could be non-urgent but still important tasks? It might be finish wrapping all the gifts, or buy groceries for dinner. Spending five or 10 minutes to evaluate tasks will save you more time than if you rushed into the day. You’ll experience more holiday stress if you put too much on your plate. 2.) Ask for help or delegate tasks. Say you already finished your most urgent tasks but there are still more things to do before you can sit down. Stave off holiday stress by asking for help! Go back to your list. 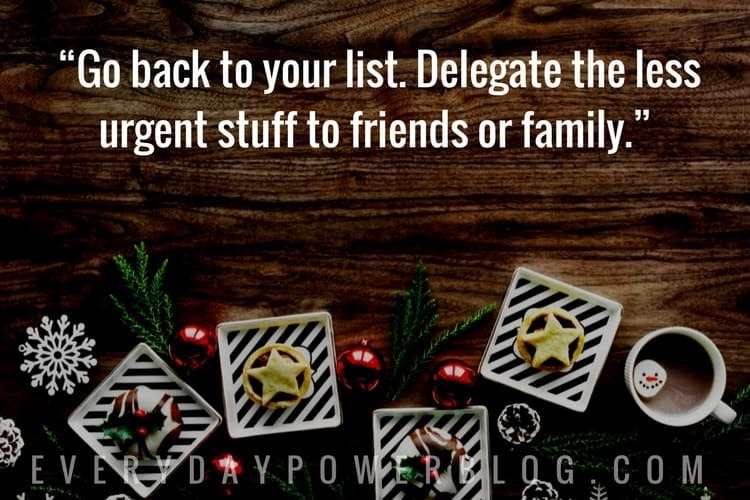 Delegate the less urgent stuff to friends or family. Even kids can pitch in. In fact, children would love to get involved in easy tasks. Not only will you get extra hands, they’ll truly feel the holiday spirit when they can help mom and dad. Unfinished gift-wrapping? Maybe your partner can help when he or she comes home. Not enough groceries for dinner? Ask your teens if they can stop by the store. Christmas tree looking a little bare? Get the kids to hang their favorite ornaments! Not enough appetizers for the in-laws? Phone your best friend and ask if they can bring a batch of their World Peace Cookies to share. As a bonus, they can stay for dinner. It’s a win-win! Holiday stress doesn’t just happen because people have a lot to do – you can also experience it through constant worrying. 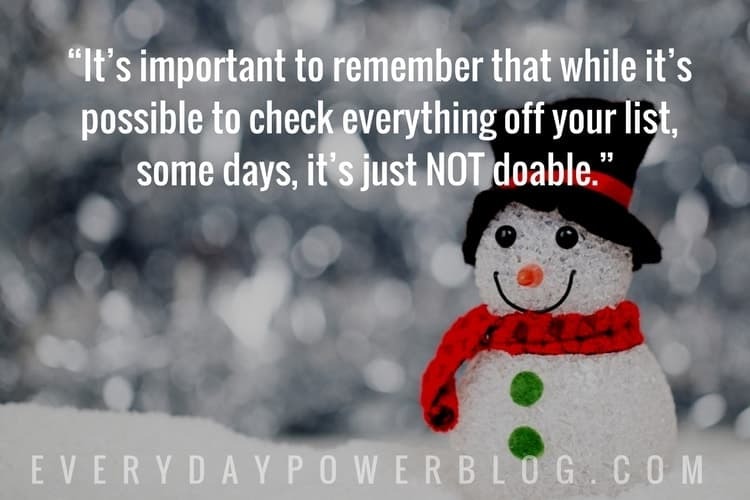 It’s important to remember that while it’s possible to check everything off your list, some days, it’s just NOT doable. Things happen. Your partner might come home late, the kids might be in a bad mood, your friends might be away on their own holiday, etc. When things don’t go as planned – and there’s only chicken instead of turkey –don’t fret. People are more understanding than you sometimes give them credit for. Sure, the main course isn’t what your guests expected, the table napkins don’t match the table runners, and there are still no gifts under the holiday tree – but it’s all good! The point of the holidays was never the perfect dinner or the lavish gifts. Having your family and friends around you, all safe and sound, is 10 times better than a picture-perfect social media post anyway. 4.) Smile – even when it’s hard! Often, even when you tell yourself it’s OK that dinner’s a little burned, you can still get pummeled by holiday stress. When tensions get too high, you could end up in tears for the most random things. It’s times like these that you need to remember to smile. Been stuck in the kitchen too long? Smile because you’re preparing something good for the family to enjoy later! Have aching feet from running errands all day? Smile because you can soon go home to a nice, warm bed. Annoyed by nit-picking relatives? Smile because it’s better than being in argument over nothing. Smiling instead of getting angry saves you energy. You also set a good example for your children (for those who have them). 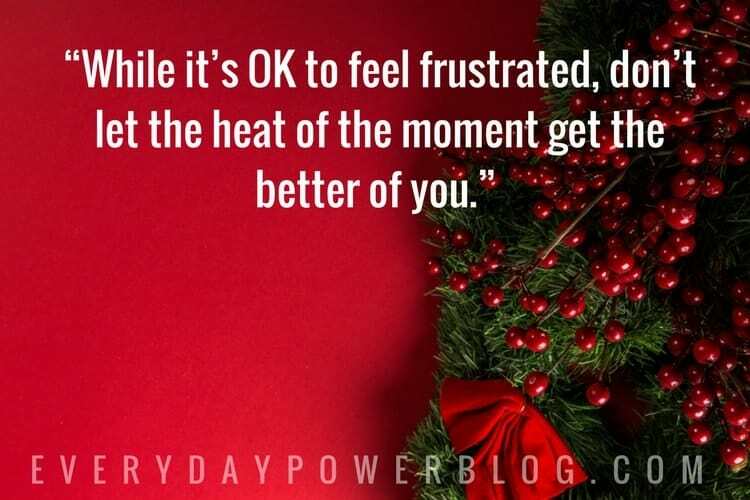 While it’s OK to feel frustrated, don’t let the heat of the moment get the better of you. Whenever you feel the urge to blow up, scream, or say something nasty, PAUSE. Catch yourself and smile instead. Sometimes, the things we pretend to be, become what we are. So if we “pretend” that holiday stress doesn’t get to us, over time, it becomes true. So smile your worries away! Despite sky-high last minute preparations, keep in mind that you already have the true meaning of the holidays in your home: the love of friends and family.